I hope you are as excited as I am! Together we are creating a unique piece of music, based on a theme by a nearly forgotten but highly influential guitarist of the 19th century. 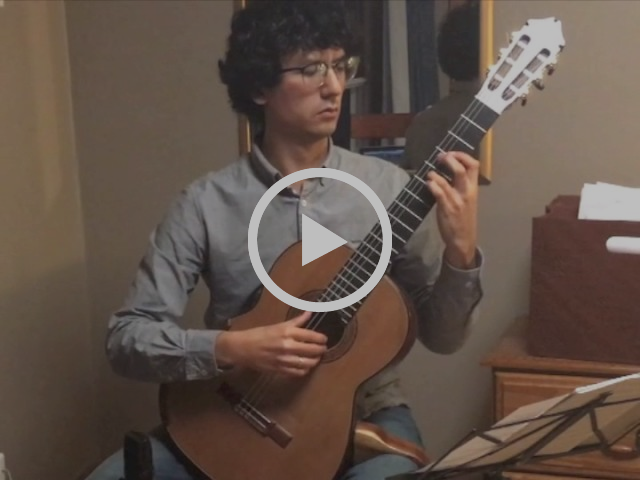 Today I recorded two variations by two different subscribers, and the video is below. I also have a third that was improvised (which I need to transcribe) and a fourth that I just received. Once I've received more variations, I will re-record all of them to create one unified video of Variations on a Theme by Pratten. 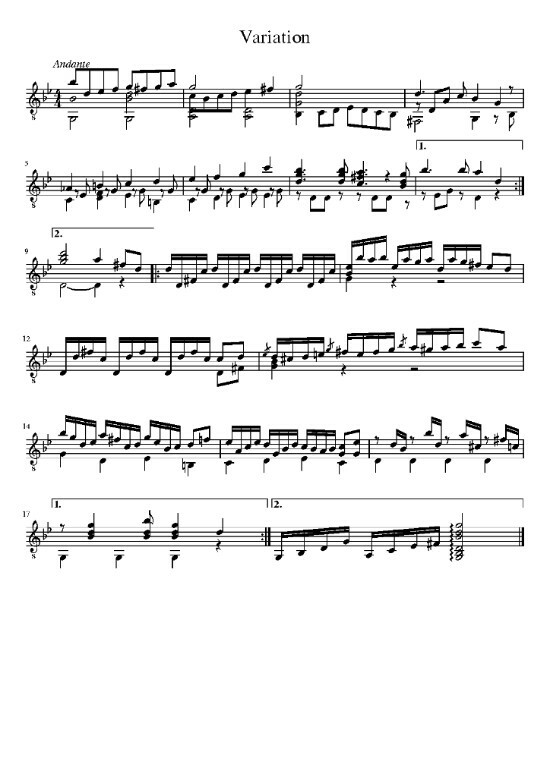 I'll then send you all the full score too so that you can play it! The score for the theme is below, just incase you missed it. The first variation in the video is by Bill Sinclair. It's a very beautifully constructed variation, with lots of contrasting figurations and textures. The opening melody begins with a conversation between the voices (top - middle - bass). The B section uses some very nifty arpeggio patterns. I particularly enjoy playing the final measure of Bill's variation - two beautiful arpeggios that create a haunting finale. I did change some notes here and there, see if you can spot them (I think I changed a note or two in about three different places). They are very small changes, but I felt that they were perhaps a bit more stylistically appropriate (for example I play an E natural in the first measure to avoid the ascending melodic augmented 2nd). I really enjoyed playing Bill's variation, it's full of subtle beauty and many interesting contrasts that I believe I could exploit further in my interpretation, given more time. Bill is a fantastic and experienced arranger, and I think he used those skills to his advantage here. The second variation in the video is by Malcolm Perris. I am so stoked at how different it is to Bill's! Where Bill's variation is a slow and lyrical one, Malcolm's is dramatic and virtuosic. The A and B sections are very contrasting - a very clever use of using two distinctive arpeggio patterns to contrast one another. The character of the A section is dramatic and almost march-like - or at least that's what I interpreted from the insistent quality of the repeating eighth note figures! The B section is a great display of virtuosity, very typical of 19th century style. I am very impressed at how Malcolm managed to keep the integrity of Pratten's theme, while using some rather sophisticated figurations. 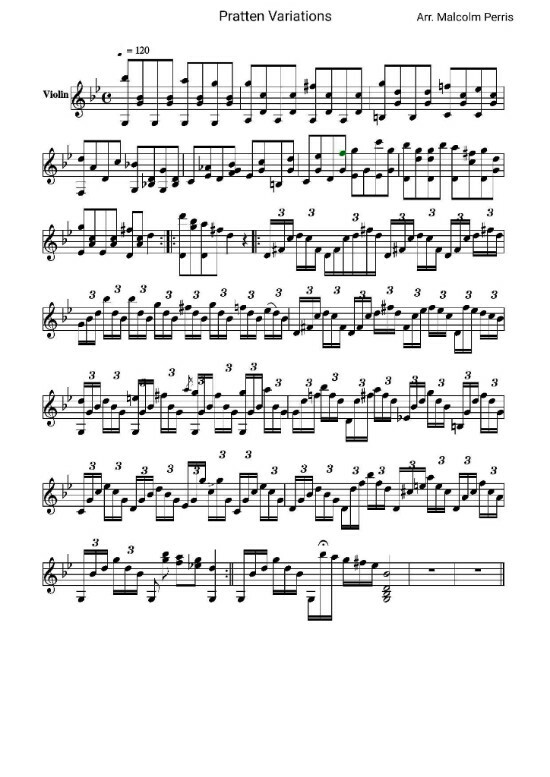 One of my favorite passages is the B section's 1st ending, with the descending thirds creating a surprising but very expressive conclusion - like the calm after a storm. I changed a few notes here and there, mostly they were just slight errors due to not having the correct accidentals - see if you can spot them. If you have experience writing out your compositions, you will know how easy it is to make little errors like this!! I sure tend to make many errors when I write things out, and constantly need to proofread. Even manuscript editions of some of the most beloved pieces in western music can contain such errors! Malcolm was also very open and shared some of his compositional process with me. One thing I was curious about was how much of a time commitment writing this variation was for him. Malcolm said that it took him about 30 minutes to compose this! He has experience composing and improvising (I'd love to see more of your compositions Malcolm! ), but I hope that this information is reassuring for some of you who might think it takes hours and hours to write a variation. If you have the correct tools (which you probably already do), then you should be able to do a task like this fairly quickly. You just need to draw on what you already know, which is probably more than you think (if you practice scales, arpeggios, ornaments, etc. then they are all tools you can use). Malcolm also had a great suggestion that could also add to your composition toolkit, which is to analyze variations by 19th century composers. Observe how they vary their chosen themes. Perhaps you could borrow their ideas and apply them to your own variation of Pratten's theme. I very much enjoyed playing Malcolm's variation - the B section was quite a challenge, and I know I could play it better given more time. Congratulations to both Bill and Malcolm! I hope their creativity, ingenuity, and inventiveness will inspire more of you to write a variation. I'll be in touch tomorrow with a couple more. 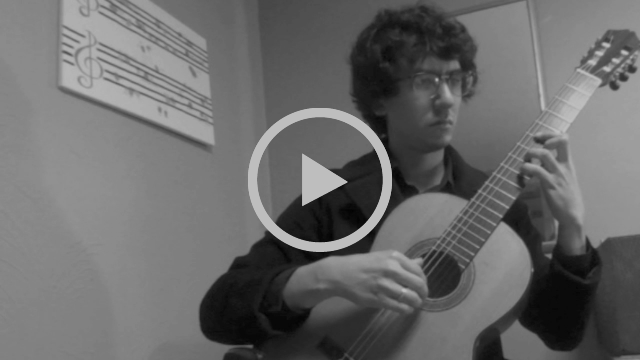 Take the course to truly learn how to think and play like a 19th century guitarist. Registration closes on Sunday at 11:59pm (EST).